SPRINGFIELD, IL -- An Illinois woman was able to marry her fiance after discovering that she had advanced cancer while planning her wedding. Destini Schafer started experiencing stomach pains last month, which led to a diagnosis that shocked her and her fiance Brandon Thomas. The couple had planned to elope in Jamaica this fall, but Schafer was hospitalized with stage 4 cancer, according to ABC News. 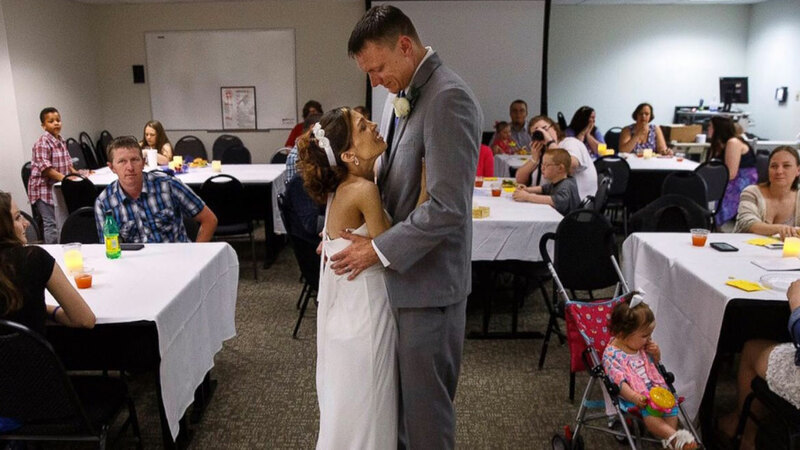 Last Friday, the couple was married at the Memorial Medical Center in Springfield, Ill., thanks to Schafer's nurse Ashley Shipley-Lovekamp. "She's an amazing person, like a guardian angel," Thomas said. "She got tuxes donated for me and my dad, and a maid of honor dress. And wedding rings." Schafer and Thomas were joined in the hospital's garden by their 8-month-old son Noah and three children from previous relationships. "I wanted Destini to be able to have a wedding because we didn't know how much longer she was going to have," Shipley-Lovecamp said. "I wanted her to be able to be happy and focus on something other than her diagnosis." Thomas set up a GoFundMe account for his new wife's medical treatment, and while they don't know what the future holds, they're "just praying for the best."